Day Four started with close encounters of the cow kind. A large herd of the critters gathered behind a fence to watch as we prepared to leave for the day's activities. James Kennerly was the first to spot them, and in no time they had lined up behind him as if he was their paramount leader, (cows will follow anyone!). Rebecca went lips-to-nose with one of the gentle beasts, followed by Jackson Watson who was eye-to-eye with another. Don't mess with James Kennerly, the cows have his back! After the cow confab we embarked on a "super jeep" expedition, (meaning a vehicle built high above the ground in order to go through streams and navigate the really rocky roads), to a remote area near the active Katla Volcano in the Thorsmork Valley. The valley is protected from the elements by the surrounding glaciers and mountains, and has a warmer climate where flowers, mosses, and ferns grow. The area is crisscrossed by glacial streams, and we had to get over them with plenty of help from our Icelandic guides, who also drove the big vehicles. Backroads leader Eva was given a hand, but the guides had some fun with her, and pretended they were going to pull her into the stream--they didn't. We entered a steep green canyon that was breathtaking. The locals refer to it as the "Lord of the Rings" canyon, but as long as we're throwing around movie analogies, to me it looked like "Jurassic Park." A rock wedged at the top of a crevasse that we passed under on our way to a waterfall inside a cave in the cliff. As long as I'm going with movie and television references about what I was seeing, this definitely looks like a scene from "Lost." Allison Watson puts a different spin on the ALS ice bucket challenge by taking a freezing shower in the ice-cold glacial waterfall. Allison's "Rocky" moment after getting the equivalent of a few hundred gallons of ice water dumped on her all at once. Tom Garvey also took the icy challenge, but it didn't throw cold water on a good time! I'd rather shoot the water than go in it! (Photo by Tom Garvey). Even the big trucks sometimes have a hard time making it across the glacial rivers, and need a little help. Our number two vehicle got stuck, and had to be pulled out. The river rose almost a foot from when we crossed it the first time to a few hours later when we came back. The almost bad news was that my computer bag was in the back of the black truck. It got wet, but fortunately my computer survived. This super jeep wasn't so super, and had to be extracted from the roaring river. Tom Garvey celebrates after his close call with the "The River Wild" (yet another movie reference . . .). Last stop of the day on the way back to the Hotel Ranga was this really beautiful waterfall. We could use some of these here in Southern California! We started our day by strapping on crampons and heading up to the Falljokull Glacier (actually, "JÃ¶kull" means "glacier" in Icelandic). A river runs under the glacier, and most of our merry band filled their water bottles from the frigid, sparkling, delicious stream. From where we stood, the top of the glacier field is filled with crumbling wall, and numerous crevasses and water cauldrons dot the landscape. One of my favorite finds were "glacier mice." The Audubon Magazine said, "The frigid, barren expanses of glaciers may not be as hostile to life as long thought--bizarre creatures have been discovered thriving inside mysterious balls of moss called "glacier mice. A pebble serves as the anchor, with moss growing around it." Our guide said these green mice take 40+ years to develop, and are very friendly . . .
On the Falljokull Glacier with Rebecca and James. The Backroads group on glacier minus me (I took the shot). All that glacial walking left us hungry, so our next stop was for lunch at a farmhouse. An outstanding feature of the place was that it had the most extraordinary backyard. Beautiful natural volcanic sculpture jutted out of the landscape, and made for a dramatic scene. James shot a few photos of the natural wonders with his Hasselblad, and also memorialized four of the girls who were with us. Then it was on to the next location, (our Backroads shepherds Jillian, Zuzanna, and Eva), kept us busy, but not exhausted!). We were off to Dyrholaey, a 400-foot-high coastal promontory on the southernmost point in Iceland. I was excited to see the puffins living in the cliffs, because shooting birds, (photographically speaking), is one of my real pleasures. The Backroads vans on the road to Dyrholaey, the southernmost tip of Iceland. Coming up soon, Iceland - Day 4! On Day 2 of our Iceland trip we trekked into Skaftafell National Park, part of the Vatnajokull National Park, to see the Svartifoss waterfall. The rushing river cascades over black hexagonal lava columns, and reminded me of the Giant's Causeway, a similar natural wonder that I saw earlier this year in County Antrim, Northern Ireland. The Causeway is comprised of about 40,000 interlocking basalt columns, that look remarkably similar to those in Iceland. Both were formed by volcanoes. The Causeway is also close by the town of Bushmills, famous for Irish whiskey, but as near as I could tell the two are unrelated! Each outing on the trip always includes at least one world-class Backroads guide and leader. Eva was with us on the hike into the Vatnajokull National Park to look at the falls. Backroads leader Eva at the Svartifoss Falls. When I'm shooting photos I try to find scenes that seem to reflect each other in nature. These clouds hanging over the HvannadalshnÃºkur mountain mirrored the HvÃ¶nn viÃ° Systrafoss plants in a meadow far below. I shot from a similar angle in both black and white and color using my iPhone. I ran both because I couldn't decide which one I liked the most. (I usually recommend that everyone pick one best, so I'm breaking my own rule!). HvannadalshnjÃºkur is a pyramidal peak on the northwestern rim of the summit crater of the Ã–rÃ¦fajÃ¶kull volcano in Iceland and is the highest point of the island. I was told this is a rare view because it's normally covered by clouds. It was truly spectacular, and I'm glad the weather cooperated for this Ansel Adams moment. HvannadalshnjÃºkur in the Vatnajokull National Park. Tom Garvey on the Skaftafellsheidi loop above a glacier in the upland heath of Skaftafell National Park. Taken by Rebecca Kennerly with the iPhone panoramic app. Rebecca's shoes came apart during her hike. She's tough on her gear! Iceland -- Day 3 of the Backroads trip coming along tomorrow! After spending two days in Reykjavik on our own, Rebecca and James and I linked up with the Backroads group for a week-long tour of Iceland's southern coast. It included biking, hiking, boating, and of course, eating some fine food! Backroads is a company we have linked up with several times in the past. Earlier trips with them were to Costa Rica, France's Loire Valley, Yellowstone, and Glacier Nat'l Park). We joined our Backroads guides Zuzana from Slovakia, (our second time with her, the first in France), Eva from Catalonia, and Jillian from the USA. We flew from Reykjavik's domestic airport to HÃ¶fn in southeastern Iceland. The 300 mile trip took less than an hour, and we flew over some stunning landscape, including the vast VatnajÃ¶kull glacier, Europe's largest, that covers over 5,000 square miles of territory. We would explore part of it later. After landing at HÃ¶fn we headed over to a nearby farm for lunch. I've never seen a backyard quite like this! As we drove up the road to the farm, we saw the glacier stretching out above it. Really a spectacular sight. The farmer had several kinds of animals, including a celebrity goat, famous for his appearance in, “The Secret Life of Walter Mitty,” a film starring and directed by Ben Stiller that was shot on location in Iceland. We also met a couple of curious geese, a baby reindeer, and a duckling being raised with chickens. Granted it wasn't gorillas in the Rwandan mist, but a small representation of some of the animals on Noah's Arc. (Noah was also filmed in Iceland . . .). A farm sits on the edge of a glacier. This Icelandic goat was the star of "The Secret Life of Walter Mitty"
Our next stop was at the Jokulsarlon Lagoon for a Zodiak boat ride at the tip of one of the Vatnajokull Glacier's tongue. Vatnajokull is a real monster, and is more than 3,000 feet deep in places. We dressed up in some red cold weather outfits that reminded me of the Michelin Man. Other than looking a bit ridiculous, it definitely had a practical application on the cold ride over the water. The lagoon was filled with icebergs of various dimensions, some of them the size of a ten-story building, others looking more like ice cubes. The BÃ¡rÃ°arbunga Volcano under the same glacier is making news this week as it generates hundreds of earthquakes that suggest it might erupt. As of this minute it hasn't. We were lucky enough to spot Arctic Terns on the icebergs. They are the farthest ranging migrating animals on earth, and see two summers each year as the flit from their northern breeding grounds in Iceland and Greenland to the Antarctic coast. Their average annual roundtrip covers almost 45,000 miles. (Some of them also breed in the Netherlands, and those Dutch relatives make an even longer trip each year!). Oor last stop of the day was to hike up on the Svinafell Glacier. I took the opportunity to photograph all of the participants in this Backroads adventure, including our three leaders. In Iceland at this time of the year you can touch sunset with one hand and sunrise with the other. On the longest day the sun sets around midnight, and is up again at 3 a.m.
Iceland also has some wild swings in temperature, from +2,000 degrees to - 40. To be fair the 2,000 degrees is what you might experience if you stick your finger in molten lava, (not recommended), and the lowest temp in Reykjavik, the nation's capitol, normally doesn't dip much below 27, even in the dead of winter. But this time of year the average temp is in the 50s. So if you're tired of the summer heat, hÃ¶fuÃ° strax til Ãslands! When Rebecca, youngest son James, and I landed in chilly Reykjavik our first stop was the Blue Lagoon, a unique place that provides a quick and relaxing jet lag fix. It was recommended to us by Bertram Van Munster, creator and producer of The Amazing Race, who used the location in Amazing Race 6 as a pit stop--it's a good one, race or no race. View of the geothermal spa Blue Lagoon outside Reykjavik taken from the observation deck. The Blue Lagoon is an unusual spa located in a lava field on the Reykjanes Peninsula, about 12 miles from KeflavÃ­k International Airport. Because our flight was an overnighter from New York, we arrived right when it opened at 9 a.m., which is also the least crowded time. We quickly changed into our bathing suits and slid into the 100-degree silica and sulfur-imbued liquid. The man-made lagoon is fed by the water of a nearby geothermal plant. Nice. Very nice. We even slapped some mud on our faces, readily available in small wooden vats that are scattered around the edge of the water. I couldn't resist trying it after reading their ad that stated, “The silica mud gives a vital energy boost and smooth complexion. Brings out the skin's inner glow. Silica mud is the Blue Lagoon's principal element. The special white geothermal mud deep-cleanses and exfoliates. Easy to rinse off.” Not sure it worked on me, but as advertised it was easy to rinse off . . . We then tried a water massage, that according to them provides, “A relaxing massage with oil that contains Blue Lagoon active ingredients. A unique experience for body and soul.” What it didn't mention was that the massage was given by a big guy named Thor, and took place on a rubber mat floating around a “special place” in the lagoon. It's hard to relax when you're worried about drowning. After languishing in the Blue Lagoon, we had a terrific lunch at the LAVA Restaurant, (I had the torched salmon, smoked onion with apple, watercress, and horseradish. It was terrific). That experience fortunately was on dry land, and in a setting that looked into the lagoon. I ultimately preferred the view to the water portion of the exercise. Afterwards James and I visited the nearby Svartsengi geothermal power plant, the headwaters of the lagoon, to take pictures. It was a really remarkable sight, with a brilliant turquoise colored river flowing out of the facility, and a large stream of steam emerging from its pipes. Clean energy yes, but with a strong scent of sulfur! The next day we tooled around Reykjavik, the world's northernmost capital. The population in the greater Reykjavik area is around 200,000, about the size of Fayetteville, North Carolina. The whole country only has 325,000, which means they could all fit nicely, (if unwillingly), into Santa Ana, California. We dropped by the city hall on the shores of Lake TjÃ¶rnin to see what is, no doubt, the world's biggest relief map of Iceland. That was a short stop. We headed up the hill to the National Museum where they had what appears to be the only collection of flying spoons on the planet. Made for a nice pic, kind of like a scene from Harry Potter. I also liked their stained glass window, and I was able to get a multi-colored pic of a house across the street. And for you Viking fans, there were plenty of artifacts from that era! There are excellent examples of contemporary Icelandic art all around the city. I particularly liked the 1936 piece, “FÃ³tboltamaÃ°ur,” (footballer), by Sigurjon Olafsson in front of the National Gallery of Art. A nearby street had a colorful mural on the wall against the backdrop of a Russian Orthodox-style building providing contrast. Iceland is also known for having the highest per capita income. That's a good thing because it's also one of the most expensive places on the planet to visit. In another per capita bit of trivia, they consume more Coca-Cola than anywhere else. The price? Three bucks for a small bottle of the carmel colored stuff. A highlight for me was visiting HÃ¶fÃ°i House, the site of U.S. President Ronald Reagan's 1986 summit meeting with Soviet President Mikhail Gorbachev. That occasion produced a TIME Magazine cover for me, and also led to a photo of 1985 Miss World HÃ³lmfrÃ­Ã°ur KarlsdÃ³ttir, a native Icelander, jogging around Reykjavik wearing a Reagan/Gorbachev sweatshirt. (She was the first Major Mizz W from Iceland, but two others have since held that title, Linda PÃ©tursdÃ³ttir in 1988, and Unnur Birna VilhjÃ¡lmsdÃ³ttir in 2005. Not bad for one of the world's smallest countries with some of the biggest named people. My next blog coming up will talk about, and show photos of our six days Backroads trip through Iceland! 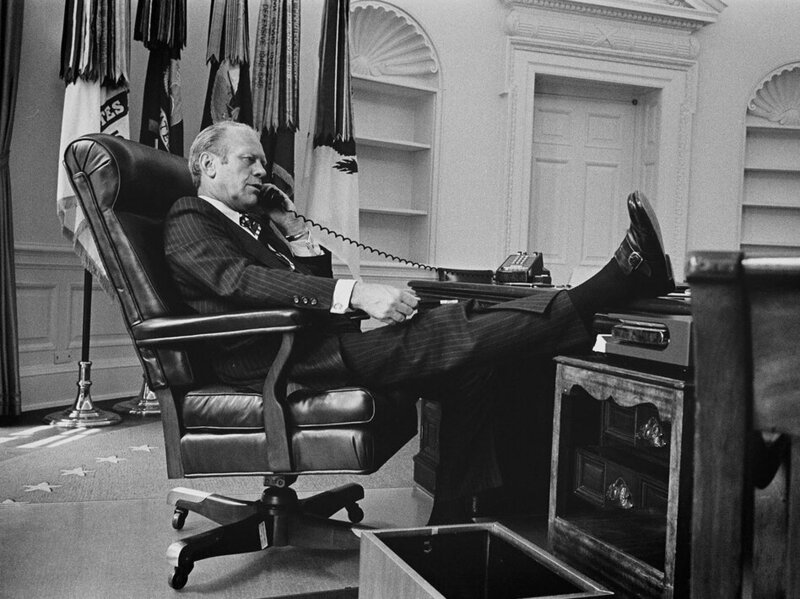 President Gerald R. Ford in the oval office during his second full day as the nation's 38th chief executive. When President Ford took over from Richard Nixon the country was ready for a little less drama emanating from the White House. Ford was just the guy to deliver normalcy. One of the first pictures I took of him at work showed a guy comfortable in his new role, even though the empty shelves behind him that had contained Nixon memorabilia were a clue to the abruptness of the transition. President Ford never displayed any anxiety about taking over the world's most difficult job, and my photos reflected that. 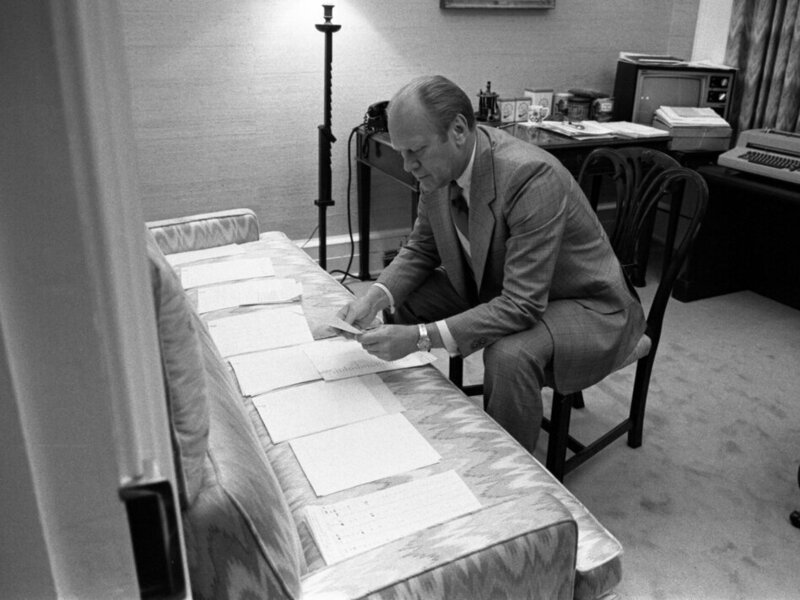 President Ford inherited the Nixon Cabinet, and gradually replaced most of them over the next year. He felt that it was important to put his own stamp on the White House team, and his appointees included Bill Coleman, the second African American to be appointed to a cabinet post, (the first in a Republican administration), and Carla Hills, the third woman to ever serve in that capacity. Secretary of State Henry Kissinger wasn't replaced, and stayed throughout. This moment, as many in the White House, is a combination of history and irony. George Bush, a fellow World War II Navy veteran, was one of President Ford's first meetings after he took office. Bush was head of the Republican National Committee, but was named the U.S. envoy to the People's Republic of China, something they discussed here, a few days later. Bush was then recalled from China to replace William Colby as head of the CIA. Bush was also on Ford's short list of candidates to become his vice president, but lost out to Nelson Rockefeller. He would go on to becoming Ronald Reagans VP, then the 41st President of the United States, so things didn't turn out so badly after all! He of course, is also the father of George W. Bush, the nation's 43rd president. John Adams, the 2nd president, and John Q. Adams, the 6th chief exec are the only two other father and sons who were Presidents of the U.S. This moment falls into weird presidential trivia: Who was the first president who had to pick someone to succeed him as vice president? The answer, of course, Gerald R. Ford, who became Nixon's VP after Spiro Agnew resigned, then replaced Nixon as president after he resigned, then chose Nelson Rockefeller to replace himself as vice president. Whew! And he did it with a bunch of resumes spread out on a couch in his office. Here I am with President Gerald R. Ford shortly after he took office. One more bit of presidential trivia. Who was the third civilian to ever hold the post of personal photographer to the president? That would be me . 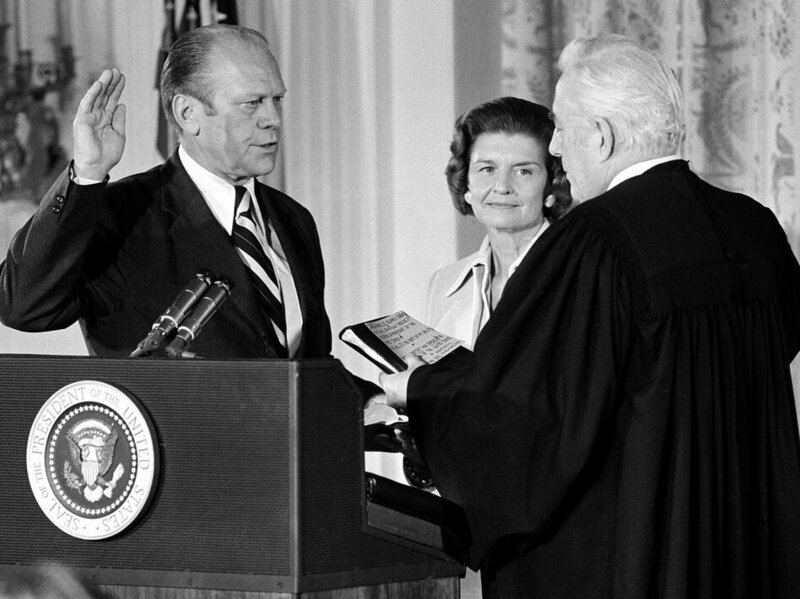 . .
Gerald R. Ford is sworn is as the 38th President of the United States at noon on August 9, 1974. When Gerald R. Ford assumed the presidency on August 9, 1974 he declared that, "Our long national nightmare is over." In the short term I suppose he was right, but his own personal nightmare began a month later when he pardoned Nixon on September 8, and his popularity plummeted to 37%, a poll number better than Truman's after he fired McArthur, but not by much. The pardon of Nixon ultimately cost President Ford a full term in his own right. The Fords at home in Alexandria the night he became president. (L-R) First Lady Betty Ford, Steve, Jack, Susan, and President Ford. That night after Ford became president I was invited over to the family home in Alexandria, Virginia to take a few photos. He also wanted to talk to me, and asked me to stay after their other friends left. We sat down in their homey living room, President Ford was puffing on his pipe, and I was a bit nervous. (It's not everyday that a kid from Roseburg, Oregon gets a one-on-one with a guy who has only been President of the United States for nine and a half hours!). I was pretty sure he was going to ask me about the White House photographer's job, and I was right. I had given it a lot of thought, even though Mr. Ford hadn't hinted that he wanted me to do it when he was the vice president, but on the other hand he hadn't talked to much of anyone about a Ford presidency for fear of looking like he was trying to push Nixon out. During the Nixon administration Ollie Atkins had been the official photographer and had very limited access to the president. That's the way Nixon wanted it, but it wasn't going to work for me. After all, I had a great job as one of TIME Magazine's top photographers, and didn't want to be demoted to sitting outside the oval office waiting for some secretary to tell me when I could go in to take a couple of quick shots of the president. That's essentially what happened to Ollie. The president started right in by asking me about the White House photographer's job, and was I interested. I looked him in the eye and told him what I thought. "I would like to do it if I report directly to you, and have total access to everything that happens in the White House." Smoke curled from his pipe as he thought about that rather brazen request. "You don't want Air Force One on the weekends?" he joked. We both laughed. Two out of three was just fine. 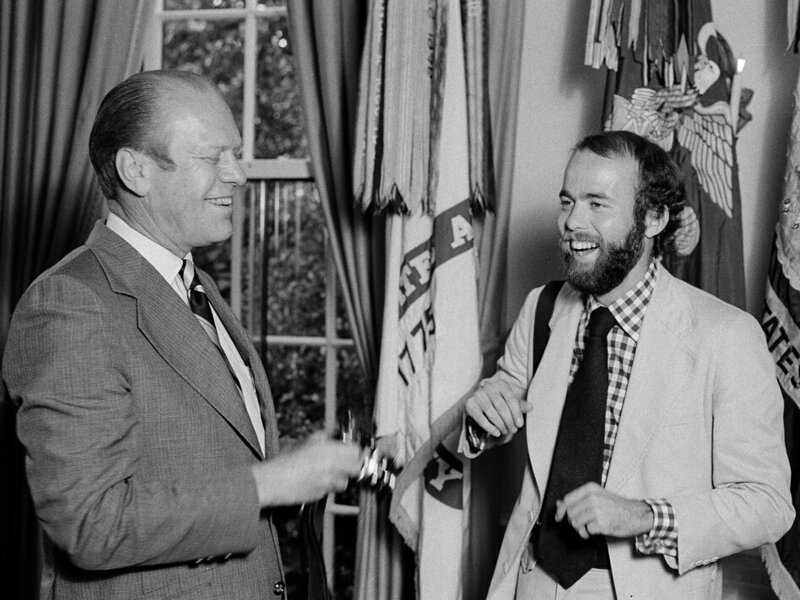 ”‹As always President Ford was mindful of others, and told me that he wanted to talk to Chief of Staff Alexander Haig about how to handle things with Ollie, who hadn't planned on leaving. He didn't want to hurt anyones feelings he told me, but he wanted me there. "Let's go watch the news," he said, "I'd like to see the swearing-in." We went into his small den, and he tried to turn on the television. It was broken”‹. "You'd think at least the president would have a tv that worked!" he said. There was another set that did, in the President and Mrs. Ford's bedroom. Steve, Mrs. Ford, and Susan and I went in there to watch the late news, the lead story of course featured Nixon leaving and Ford becoming president. After that was over I got up to leave, and said it had been a long day, and that we all had to start early in the morning. In a moment that I will never forget, President Ford stood up, took my hand, and said, "How will your photographer friends feel about you working in the White House after everything that has happened over the last few months?" I was really taken aback by that comment, here was a guy who had the weight of the world on him now worrying about whether or not it was a good idea for me to work for him. "They will be happy to have one of their own there, and they will also be glad to finally have a friend in the oval office," I told him. The next day”‹ I was in my office at TIME when I got a page over the intercom. "David Kennerly, call the switchboard." I picked up the phone, and one of TIME's receptionists, who sounded a bit frazzled, said, "David, President Ford wants to talk to you." I said, "Tell him to call back, I'm busy." She practically screamed, "He's on the line!" Oh boy. "Hi Mr. President," I said. "How would you like to come work for me?" It was official. "I'd love to,"
I said. "Well, you better get over here right away then, you've already wasted a half a day of the taxpayers money!" The TIME office was right across Lafayette Park from the White House. I grabbed my cameras, and set out across the square for an adventure that turned out to be one of the best two and a half years of my life. 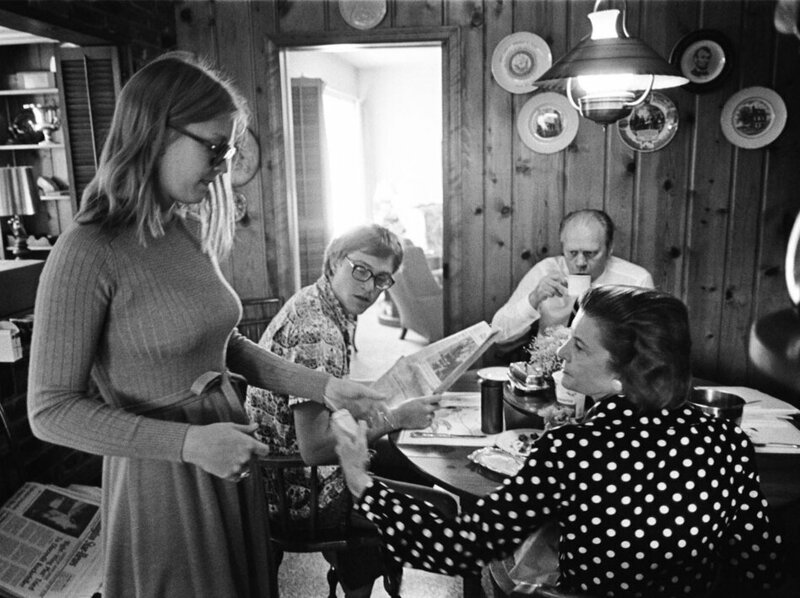 The President and Mrs. Ford and Jack and Susan in the kitchen of their Alexandria home. In a scene reminiscent of a 60's family sitcom, Gerald Ford, now President of the United States. leaves home for work at the White House as wife Betty waves goodbye. She might be saying, "Don't forget to pick up the cleaning on the way home from work, Jerry!" The Ford's stayed in their modest Alexandria home waiting for the Nixon's belongs to be removed so that they could move in. 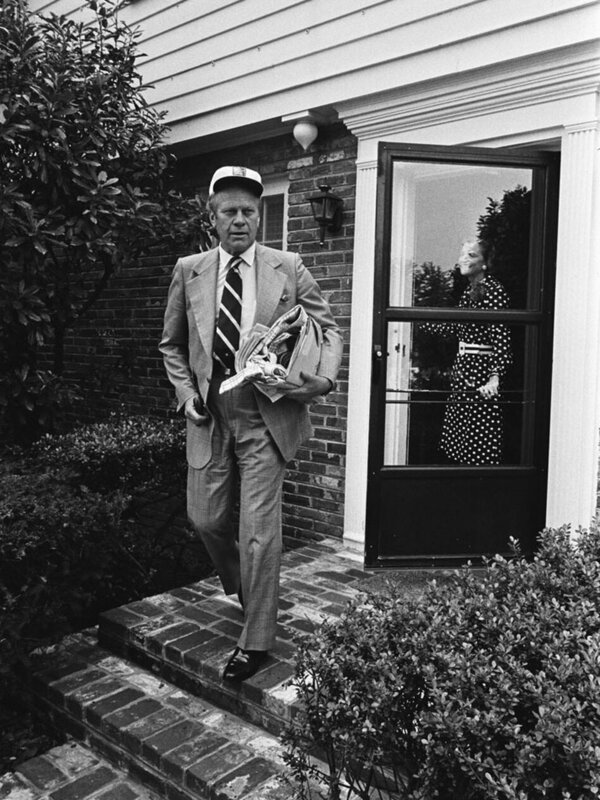 President Ford became a commuter president, making the drive from Virginia and back for ten days until he and the family finally occupied the Executive Mansion at 1600 Pennsylvania Ave.
Nixon looks at White House for last time as president before boarding helicopter. Nixon resigning, and leaving the White House forty years ago today, was one of the top five stories that I've covered in my career as a photographer. The others, in no particular order, are Vietnam, Jonestown, Sadat's trip to Israel, and the Reagan/Gorbachev Summit in Geneva. There have been plenty of others! When I revisited this sequence of photos of Nixon on the steps of Army One, the presidential helicopter, I had always keyed on fame #12 as "the moment." A grim Nixon, lips pursed, arm bent as he gave a sharp wave goodbye, was leaving The White House in disgrace. It was a frame that I had always thought said it all. But not really. Forty years later, and after much consideration, I think the most telling photo is frame #11, where Nixon, having just started up the steps, turns and looks back at a scene he will never see again as president--the South Portico of the White House looming before him. His face reflected that split second of pain, humiliation, and loss. He then gave a curt wave. Moments later, and you had to be there to see and hear the rest of what prompted his actions, the crowd who had gathered on the lawn to see him off, comprised mainly of loyal White House staffers, started cheering and applauding. Nixon reacted in the manner of the old campaigner, with arms waving, and fingers outstretched with the "V" for victory sign. A smile lit up his face. But it wasn't a campaign event, but it was the last stop of the Nixon presidency. That smile soon disappeared, along with the 37th president, who lifted off from the South Lawn as Gerald R. Ford, the next president, watched from below the South Portico..
Vice President Gerald R. Ford, with wife Betty and David and Julie Eisenhower, watch President Nixon depart after resigning. A few minutes later, at high noon, Ford became the 38th President of the United States.